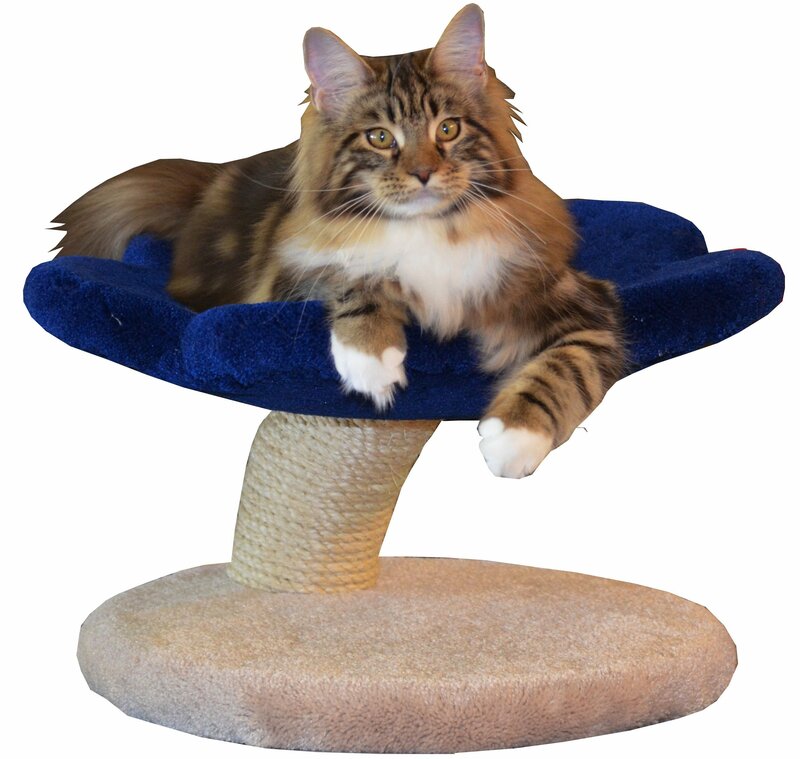 The two cave Fantasy Tree is the favourite model for households with more than one cat. The feedback we have received is that the caves are such a draw for the cats that if there's more than one cat and just one cave, they wait in line for the cave to free up. The two caves can be located on any of the top three levels and its location can be changed in a couple of minutes any time you like. If the cave is at the top of the tree, the height will be increased by approximately ten inches. The cave can be turned to face any direction and it is a great idea to change it regularly. TREE HEIGHT: the minimum height is five feet and the maximum is eight feet. COLOUR: there are two choices to be made, one carpet colour for the tree "bark" on the trunk and branches and one colour for the platforms. There is also a separate selection for upgrading the platforms from the standard "moss-covered" pads to the Cloud 9 dish. SISAL ROPE: the carpet on the trunk and branches can be switched to sisal rope, for a look similar to the Stratus Tree. If used in combination with cedar platforms and a wood base, it becomes a good option for a household in need of a "near" hypoallergenic option. Please refer to All Wood Products for more details. TOP CHOICE: the top level of the tree can be upgraded to a large dish, a small flower or a large flower. There is then a choice for the colour of this top level. FINISHED WOOD BASE UPGRADE: the standard tree comes with a carpeted base included. You may upgrade to a finished wood base (3/4″ pine) with clear varnish or with a light, medium or dark walnut stain. HAMMOCK: one or two hammocks can be added to the tree. RAMPS: a set of ramps can be added to the tree and there is a carpet colour selection also. Still more levels can be added, specific carpet colours can be requested (beyond the examples shown in the photos and in the options menu (usually at no extra charge). Feel free to email with any specific requests prior to purchase.